Last year we had a student who mentioned how convenient it would be to have an Ikea catalog for bioinformatics/Omics-science, where you could just go in pick all the parts pre-fashioned put them together and wah-la your dataset would be complete and you would know what you have with minimal assembly required. How do you know you are using the right parameters? What if you are missing a part (ie. reference genome)? What is the best program (kit if you will)? What is the ‘correct’ way to do things? What do you do if what you want isn’t ‘created’ yet? We have chosen a field that is still evolving. Perhaps you didn’t choose bioinformatics, perhaps you were thrown into bioinformatics due to your love of rodents, invertebrates, the Ibex, Mesozoa, cyanobacteria or in my case Dengue fever. Yes, I fell in love with a virus that can cause violent internal bleeding in it’s worst form –we all have our quirks! In my defense there are microbiologists that spend the better part of their careers neck deep in sh*t and they love it. I didn’t start out ‘wanting’ to be a bioinformatician, I use computational biology/bioinformatics to accomplish my research goals. I got my Ph.D. during a time when bioinformatics was just emerging, there were no rules, no structure, no classes, no workshops, no guidance really of any sort — it was a free for all…and I think you’ll agree that’s pretty scary. But that’s also the point. It’s exciting, no one can ‘tell you what to do’ and order you around, you are your own rise and fall –you can try and do whatever you want! During my Ph.D. my advisor kept wanting to try new things, use the newest programs, employ the latest algorithm and I had to explain it all which was challenging when I had little computing background, no classes and the manuals were not fantastically informative. As a result my fellow Ph.D. students and I put up a sign in our lab: “Adapt or Die!” because we really felt that was where we were headed. Because our field is still evolving we will need to evolve with it and even be apart of the evolutionary process. There is no ‘meaning of life’ answer in bioinformatics right now. It would be lovely if the answer to life and to the ultimate question was ’42‘ (if you don’t know this reference click the link). But really there is no ‘right’ way to do things right now in bioinformatics. 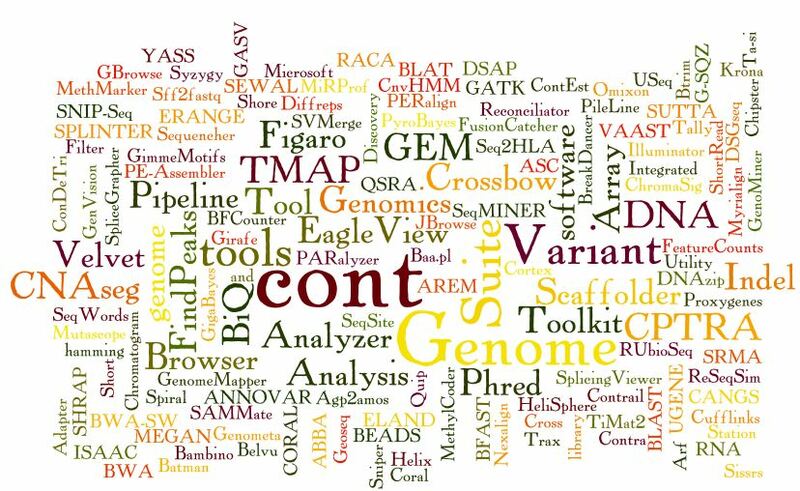 At last count, (5 min ago), there were 651 bioinformatics applications, 615, references, and 875 URLs in SEQwiki. So there are a lot of options out there and basically as the researcher you have to define what is it you want to answer…what’s your question what is your clear path, your hypothesis then once that is clear you have two options. Comb and compare programs that look like they will do what you want them to do or build your own. Some programs will be fantastically documented, others will not, some programs will eat your computational power inside and out, some simply won’t work. At the workshop you’ve been or will be introduced to a lot of different programs. You’ll notice many slides have other links, references and programs that you can try depending on what it is you want to accomplish. Personally, I didn’t find a program that summarized the quality of our data (derived from 3 different platforms) exactly how I wanted it with specific metrics…so we built one. All the metrics could be drawn from the BAM file so we built a program that would specifically summarize what we were interested in from the BAM. There is no program that specifically corrects consensus sequence automatically inserting ambiguities. This was important to me because I work with a quasispecies so I sometimes cannot call an ‘A’ an ‘A’ because I have more than one ‘variant’ within the viral swarm (population) I sequenced so I need ambiguity in the consensus to reflect that. So we are building one leveraging the strength of BAM and VCF files. So I am not re-inventing the wheel as much as adapting it for different terrain. There are lots of buttons to push but no push button solution. “To do everything” while admirable, is not an appropriate goal. What is it you are trying to accomplish with your research? What is your goal? Can you write your specific hypothesis? This will help you immensely on narrowing down methodology, the programs that might be useful, and how to know if your dataset can even answer this question. As Mike stated much of next generation research today has moved away from discovery and is becoming hypothesis driven. Don’t expect the data to tell you your hypothesis, first form your hypothesis based on your literature reading and preliminary methods analysis then design your experiment and see if your data answers the hypothesis. You must crawl before you walk, walk before you run, run before you sprint. I think incremental understanding is under appreciated sometimes, especially when you are jumping fields. Computer science, programming, software engineering are completely separate fields from biology for good reason –they are completely different, in mindset and practice; an essential re-wiring of the brain in some ways. Don’t have an unrealistic expectation of what you should be able to do in a field you were not originally trained in. Don’t be afraid to back up, slow down and really understand what one tool is telling you or what the code is saying before moving to another and/or completely discarding it. I realize the field moves incredibly fast…but not so fast that you don’t have time to understand the building blocks that make the program work and what the program is saying. Well that’s all fine and inspirational…but where does this leave you at this moment in time in terms of what to do and where to go next? Daniel had a great suggestion…find a publication you think it really cool or uses methods you would like to use. Pull the data (which should be publically available) and try and recreate what they did. Look on forums or google groups. Most big software packages have forums or google groups associated with them. BioStars and SeqAnswers are good places to start. Try your dataset out on different programs or using different algorithms and see how they differ. It will help you decided which one makes more sense to use for your research. Be suspicious. If it looks too good to be true, it probably is. A large majority of your “Eureka!” moments will just be errors and systematic bias. And I think that wraps it up…no Ikea catalog? No problem, we are up to the challenge.